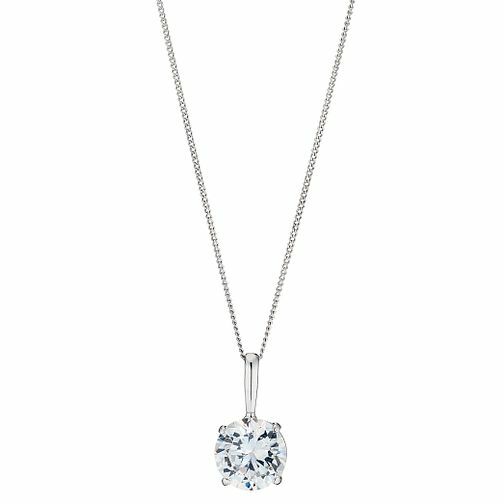 Featuring a dazzling cubic zirconia centrepiece this stunning pendant is crafted in 9ct white gold. Destined to win her heart. 9ct White Gold Cubic Zirconia Round Pendant is rated 2.8 out of 5 by 4. Rated 1 out of 5 by Anonymous from it is not worth the price and too flimsy it is not worth the price and the chain is too flimsy. It can easily break. It would be better to sell just the pendant slightly larger. Or to have the chain made stronger. Rated 5 out of 5 by Anonymous from Good but a bit flimsy Very small with a weak necklace but not bad if the price was cheaper!